The Emperor is one of the major arcana cards in traditional style tarot decks based on the Latin Tarot or Tarot de Marseilles such as the Rider-Waite-Smith deck. When he appears in a tarot spread, he has special significance for the querent, and examining the symbolism on his card can provide valuable insight. Sometimes known as the grandfather, the Emperor is depicted as a wise-looking older man with a flowing white beard and hair and a golden crown with jewels perched on his head. His eyes glance off to the right as he sits on a throne made of stone with rams' heads on the corners of the throne back and each armrest. In his right hand, he holds an ankh scepter. In his left hand, he holds a golden globe. He is adorned in red robes and armor. His throne sits perched atop a mountain with a gold, red, and orange sky in the background. The fifth card in the major arcana, the Emperor is numbered IV (four) because in Latin tarot, the major arcana cards start with 0 (zero), The Fool. The major arcana cards show a common path the soul takes on the journey to enlightenment, and the major arcana cards that show in a reading tell the querent something about where they are along that journey. The Emperor comes after his partner, the Empress, who speaks to creativity and fertility, and before the Hierophant, who shares many of the Emperor's fatherly ruler qualities but also depicts the next level in the journey of the soul beyond the earthly power of the Emperor. When the Emperor appears in a spread, he tells the querent he or she is at a significant place in his or her journey. The Emperor is number IV (four), a number of stability and balance in numerology. Four is also a number of masculinity and dependability, all qualities of a good father and partner. His appearance says much about the symbolism of this card. The Emperor's flowing white hair and beard depict wisdom obtained from age and experience. His golden, jeweled crown suggests wealth, leadership, and authority. His armor indicates protection, while the red robes suggest he is concerned with the safety of his tribe. His robe has a red heart on one sleeve, a literal depiction of the colloquialism, wearing one's heart on one's sleeve. This indicates that in his position of power and protection, he is also loving and compassionate for those he is destined to protect. His glance to the right suggests he is looking to the future. The throne he sits on is a seat of power. The ram heads are the symbols of the planet Mars, which represents aggression, courage, and war. This suggests he is willing to fight to protect the safety of his tribe. His right hand, which is his rational and conscious side, holds a scepter shaped like an ankh. The scepter is a phallic symbol of masculine authority. In his left hand, which is his subconscious side, he holds a globe representing the feminine, suggesting he works in partnership and balance with his partner, the Empress. The mountaintop shows he has reached a pinnacle, and that he is above those who are in his charge. The colors of the sky suggest the first three chakras: root, sacral, and solar plexus. These deal with earthly issues associated with the physical realm, including security and safety, tribal identity, and self-worth. 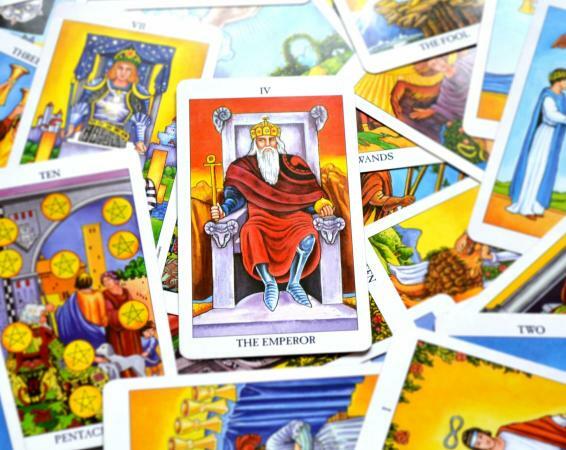 All of these offer clues to what the Emperor addresses in a tarot spread. He depicts a father and partner energy, suggesting trustworthiness and compassionate leadership. His presence talks of family and of earthly values such as safety, security, protection, and partnership. Therefore, when he appears in a reading, he is likely telling you that your earthly concerns are in a position of stability at the moment and you are safe and protected in these areas of your life. He may also foretell of the coming of a new, appropriate partner or suggest a current partner can provide what you need in earthly matters. When reversed, the Emperor suggests an excessive need for power and control. It may also reflect the negative sides of traditional masculinity, such as aggression and violence, greed, or thirst for power. The Emperor is the father figure of the major arcana. He is the yang to the Empress' yin, and he brings protection, balance, wisdom, and compassionate leadership in the earthly aspects of life.